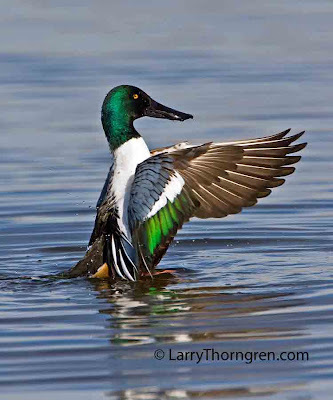 Ducks always finish their baths by flapping their wings to get all of the water off of their feathers. When this shoveler started dipping his head into the water and splashing water over his back, I knew that he would eventually flap his wings very vigorously. I have been interested in animal behavior since I was a child. A lot of my photos are the result of a lifetime of watching animals and thus being able to predict what will happen. Henderson, Nevada Bird Viewing Area. Canon 40d, 500 mm lens. Love the feathers on this guy. I see duck stamp all over this. Great photo and a fantastic capture of the flapping wings. Vermilion Flycatcher - Warning Colors? Bringing Home The Bacon - Or Was That A Robin?